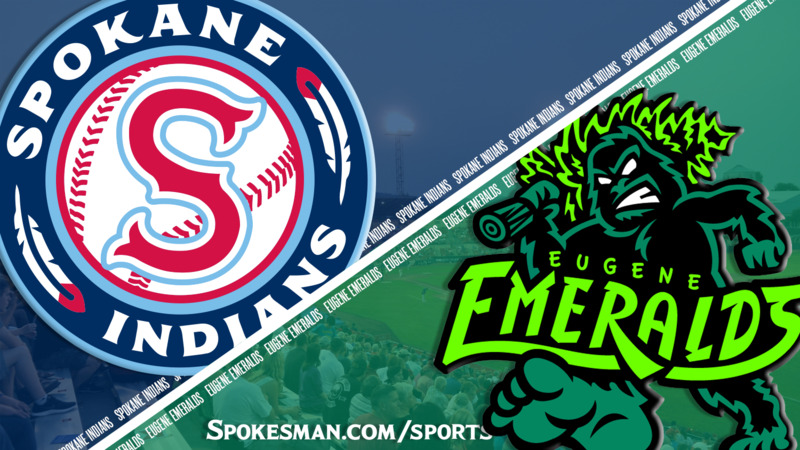 Add Ryan Dease to the list of Spokane Indians pitchers to impress over the weekend, joining Hans Crouse on Friday and Seth Nordlin on Saturday in handling the Eugene lineup. The Texas Rangers fourth-round pick in the 2017 MLB Draft has had an up-and-down season so far, but on Sunday he turned in one of his finer outings of the campaign. Dease allowed five hits with one walk, struck out six and helped the Spokane Indians beat the Eugene Emeralds 7-2 at Avista Stadium on Sunday. The Indians pounded four Emeralds pitchers for 17 hits. Jonah McReynolds went 4 for 5 with two runs and finished 8 of 15 in the series. Curtis Terry – who came in without a hit in his last 22 at-bats – went 2 for 3 with two RBIs and two walks. McReynolds couldn’t remember the last time he had a four-hit game. “The guys came out, stole some bags, went first-to-third,” manager Kenny Holmberg said. “I just wanted to be aggressive this series. The Indians have won three in a row and took four out of the five games in the Northwest League series. Dease (3-2, 5.19) had suffered back-to-back losses his last two outings. On July 7 he lasted just 3 1/3 innings and allowed five runs on eight hits against Vancouver. He gave up six runs in four innings against Hillsboro on July 1, but also owns a pair of starts where he allowed no runs. “It’s just the game of baseball,” Dease said about his feast-or-famine results so far this season. “Once you feel like everything’s going for you baseball has no mercy on you. Luis Vazquez got to Dease in the first inning, smacking a one-out solo home run to left center. After that, there was not much to be had by Eugene hitters, as Dease retired 18 of the next 20 batters. The Indians (12-18) strung together a bunch of hits in the bottom half to stake Dease to an early lead. With one down, J.P. Martinez laced a single to right and Diosbel Arias reached on an infield single to third. McReynolds lashed a double to left-center field to plate Martinez from second, and Arias then trotted home on a groundout by Curtis Terry. Catcher Francisco Ventura gave one a ride to right center, but Jonathan Sierra made a leaping catch against the wall to retire the side. Dease settled in nicely after the home run in the first. He struck out Nelson Velazquez in a 1-2-3 second inning and picked up two more Ks in the third. The Indians added on in the third – all with two outs. McReynolds got the rally going with a single up the middle and Terry bounced one through an exaggerated shift to the left side of the infield. Francisco Ventura ripped one to third that Christopher Morel tried to make a sweeping glove save like a hockey goalie, and he managed to deflected it to shortstop Vazquez, but Ventura beat the throw. McReynolds scored on the play to make it 3-1. In the fourth, Juan Ventura’s soft liner safely reached the outfield grass past the leap of second baseman Luis Diaz and Jax Biggers’ line-drive single to right put runners on the corners. The Indians attempted a delayed steal of home by Ventura, but the catcher was nailed at the plate after the relay from second. Biggers was safe at second with the steal and Martinez drew a walk, but Arias flied out to end the threat. McReynolds led off the fifth with a single, his third hit of the day, and Terry drew a walk. Francisco Ventura bounced into a 6-4-3 double play but McReynolds moved up and then scored on Starling Joseph’s infield single. Cristian Inoa followed with a ground-rule double to right but Juan Ventura popped out to end the rally. Biggers led off the bottom of the sixth with a walk and scored from first on a one-out double by Arias. With two down, Terry lined one up the middle and Arias slid home just ahead of the tag to make it 6-1. Eugene (10-20) picked up a run off Dease with two down in the seventh. Jonathan Sierra reached on a ground ball and scored on Velazquez’ double off the wall in center. On his 101st pitch, Dease issued his first walk, and Holmberg came out to get him after 6 2/3 innings. “In the sixth everything was down, down,” Holmberg said. “He was missing down. To me that’s a good sign that he still has something left in the tank. Kyle Keith came in and coaxed a foul out by Morel to end the inning. The Indians got that run back in the bottom half of the seventh. Cristian Inoa roped a one-out single to center, went to third on a soft line-drive single by Biggers and scored on a throwing error by third baseman Morel on the play. McReynolds added a single off the shin of reliever Carlos Vega in the eighth inning. Published: July 15, 2018, 6:38 p.m. Updated: July 15, 2018, 7:22 p.m.